Shallow, small to medium-sized, canopy covered forest streams and adjacent shaded areas. This is a large, 17 ⁄16″ to 2¼″ long, showy, broad-winged damselfly. The head, thorax, and upper (dorsal) and side (lateral) surfaces of the abdomen of the male are iridescent. The apparent color is determined by the quantity and angle of available light. In good light they appear brilliant metallic green or bright metallic teal blue depending on the angle of the light. In deep shade they appear black. The 8th and 9th abdominal segments have a white lateral patch. The lower (ventral) surface of the abdomen is black. The wings are 1″ to 17 ⁄16″ long and are broad, 3 times as long as wide. On mature individuals they are wholly black. They are not stalked at the base and there are no contrasting stigmas. The area between the base of the wing and the notch (nodus) is crossed by numerous veins. 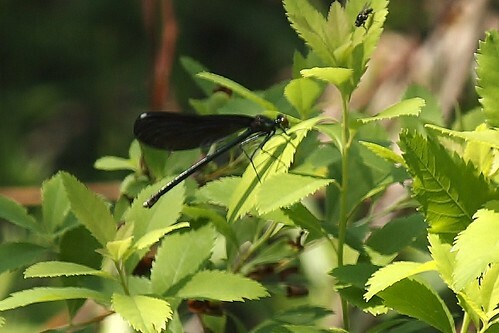 The legs are long, slender, and dark. The female is similar but less brilliantly colored. It may appear bronze, gray, or black with a slight bluish-green iridescence. The 8th and 9th abdominal segments have a brown lateral patch. The wings are lighter, dark gray near the body becoming almost black at the tip, but not appearing banded at the tip. There is a white area (pseudopterostigma) on the leading edge of each wing toward the tip. It is crossed by veins so is not a true pterostigma. It is nearly half as wide as long and is conspicuously widened at the middle. Immature adults have light brown to dark brown wings. 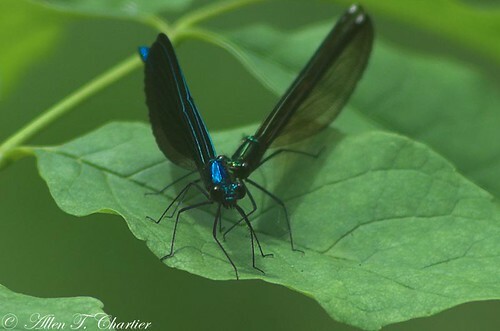 River jewelwing (Calopteryx aequabilis) wings are narrower, 3½ to 4 times as long as wide. They are conspicuously banded, with a clear or smoky band on the inner part of the wing and a dark band on the outer part. The pseudopterostigma is more slender. Adults emerge from late May to late August, the last emerging ones flying until early September. After mating the female oviposits eggs inside soft, submerged stems of aquatic plants in a slow moving or quiet area of the stream. Naiads remain in the water for about one year, molting 10 or 11 times before emerging as an adult. They reach sexual maturity in about 11 days and live on average for 16 to 20 days. Males compete vigorously for territories with suitable egg-laying submerged vegetation. Sources: 7, 17, 18, 24, 29. This damselfly is often seen in large numbers but for only a short period and then not again until the next year. In Calopterygidae, a pale spot containing numerous cells at the leading edge of each wing toward the tip. It is crossed by veins and therefore is not a true pterostigma. [= stigma] In Odonata and Hymenoptera, a blood-filled blister or dark spot at the leading edge of each wing toward the tip. It is heaver than adjacent, similar sized areas and is thought to dampen wing vibrations and signal mates. I also found several adults deforemed, body was crooked and wings were not completely expanded. This was inTiughnioga River in Cortland County near Meesengerville. I was wondering if the deforamtions were due to pollutants in the river or there was problems such as river level rose or rained etc. during emergence. Video taken at the Bluff Spring Fen Nature Preserve in Elgin, Illinois on July 5, 2009. So many all about submerged trees in this slow moving River today. Looked great in the sun. First time I've ever seen these but there were tons of them along the river. Location: In an area near a creek in Norman County, Mn. 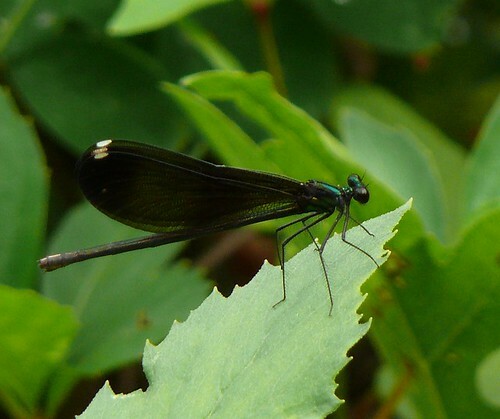 I have seen the ebony jewelwing here in St. Wendel, in Stearns county. I plant lots of flowers and we have a variety of habitat , including swampy, low areas, open fields, deciduous and conifers. I've also seen the twelve spotted skimmer.